Manchester Show 2011: Rok:Modul Vox conceals your kit | What Hi-Fi? 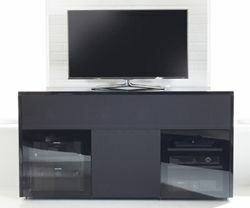 AV furniture specialist Rok:Modul has an innovative new model on show. The Vox is a glossy, modular equipment system that means you can hide even beefy AV components out of site, while benefiting from features including enhanced isolation, ventilation and cable management. The Vox comes in three sizes - the largest of which (2m wide) can even house a REL Stadium Subwoofer. The three Vox options cost £850, £900 and £1200 respectively.